The gold-plating experts at Goldgenie are back again, with a new limited edition offering no less. We're talking about an iPhone 6s plated with 24k gold and a special engraving on the back that celebrates the Chinese Year of the Monkey (which we've just entered). The gold-plating experts at Goldgenie are back again, with a new limited edition offering no less. We’re talking about an iPhone 6s plated with 24k gold and a special engraving on the back that celebrates the Chinese Year of the Monkey (which we’ve just entered). 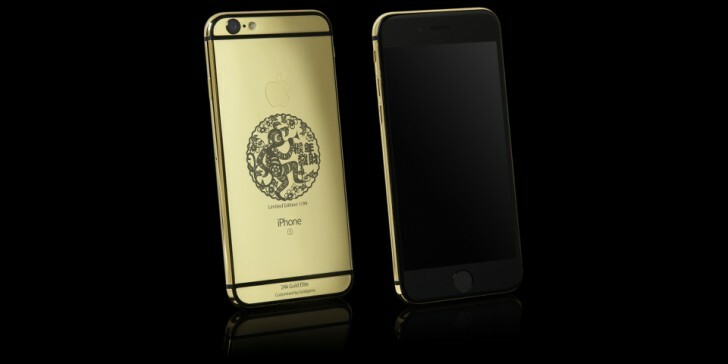 The full name of the new product seems to be Year of the Monkey 24k Gold iPhone 6S Elite. Aside from all the gold, what sets this one apart from the other Goldgenie models is the laser engraved monkey symbol that takes a good chunk of the back side of the phone, as you can see. Oh, and there’s also the fact that only 99 of these units will ever be made, and each one will feature its own unique number engraved right underneath the monkey symbol. This is apparently going to turn it into a very valuable collector’s item. As with any Goldgenie product, this one isn’t cheap either. You need to shell out at least £2,497 (that’s approximately $3,599 or €3,221 at the current exchange rates) to get one. You can pick from 16, 64, or 128GB of storage, and the phone will be delivered to you in a “luxury cherry oak display box”.